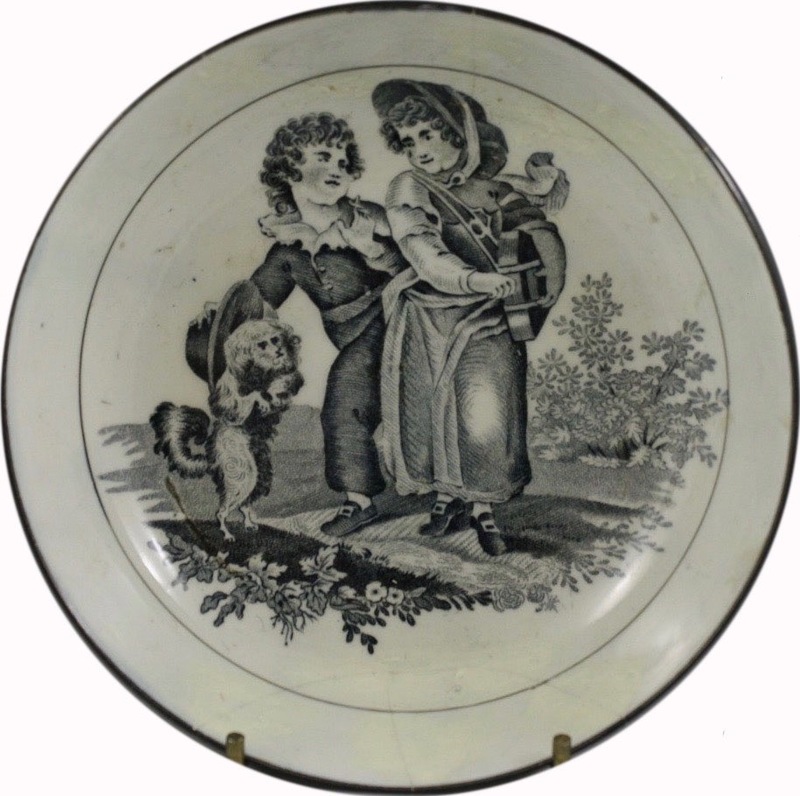 Don Pottery (1801-1839) 5.5 inch plate showing the pattern known as Dancing Dog. The woman is playing a hurdy-gurdy. While adding patterns to the Transferware Collectors Club Database of Patterns and Sources, I noticed a pattern of a young girl playing a guitar-like instrument. I knew the instrument wasn't a guitar. It was a hurdy-gurdy. How I knew this was a surprise to me. Somewhere deep in my brain was the word and the image. The hurdy-gurdy must have made an impression on me at some point, so I decided to do a bit of research. I assumed the hurdy-gurdy was a carnival instrument of fairly recent (last one hundred and fifty years) invention, but I was wrong. Close-up of the Dancing Dog pattern with hurdy-gurdy. The hurdy-gurdy, according to Wikipedia, goes back to the early Middle Ages. 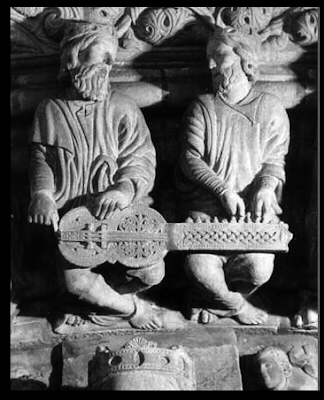 The website shows a photo of the hurdy-gurdy or its close relative, the organistrum, on a frieze on the 12th century Portico da Gloria on the cathedral at Santiago de Compostela in Spain. Playing an organistrum, which is an early relative of the hurdy-gurdy. The hurdy-gurdy is also found in the triptych by Hieronymus Bosch, "The Garden of Early Delights." The triptych has been a favorite of mine since I was a teenager. Bosch too. 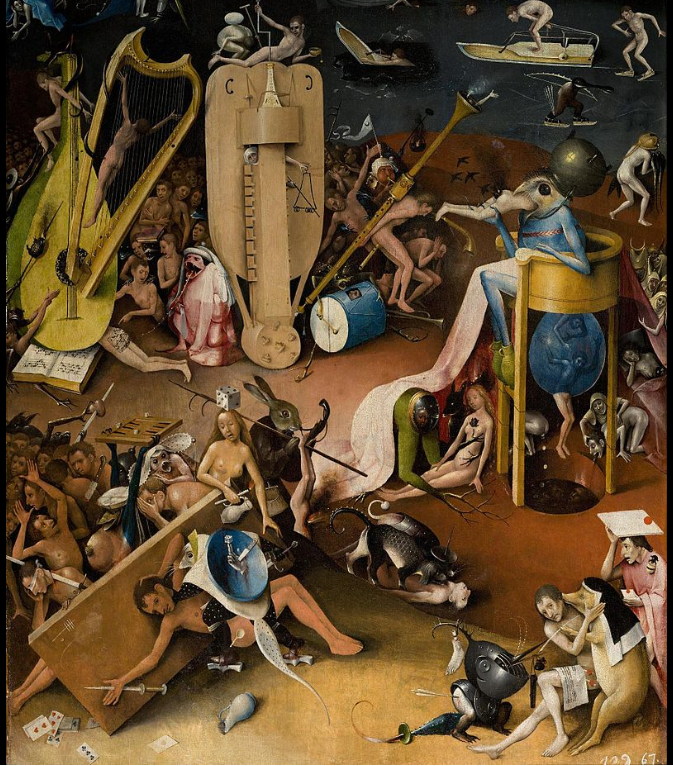 If the people look unhappy, it is because they find themselves in the part of the triptych that depicts Hell! Detail showing the first known depiction of a buzzing bridge on a hurdy-gurdy (see the instrument to the right of the harp). Garden of Earthly Delights, 1495-1505 (these dates vary). 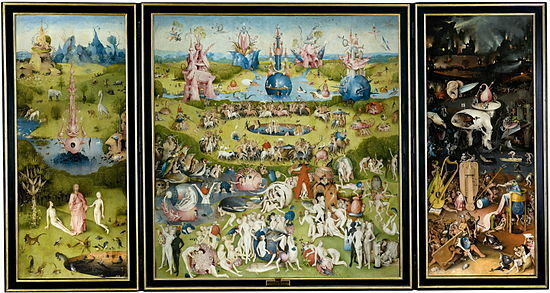 The left panel depicts the Garden of Eden, the center panel is Earth or the garden of earthly delights, and the right panel is The Last Judgement or Hell. 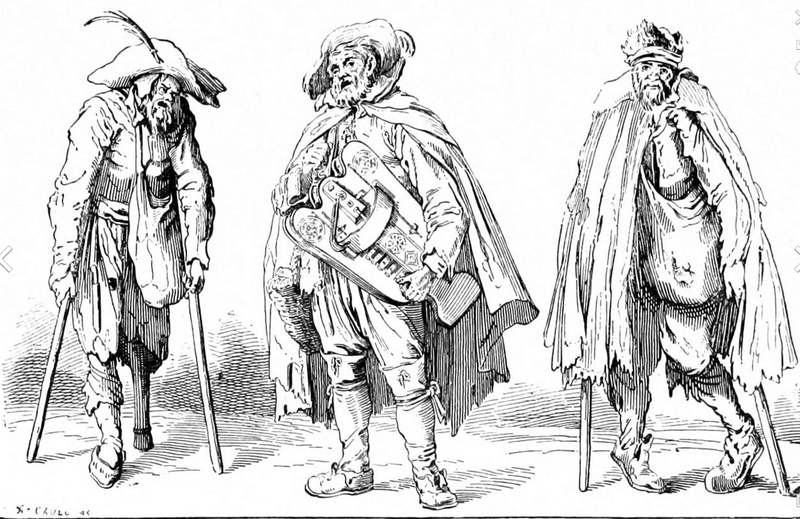 I was not totally wrong about thinking the hurdy-gurdy was used by 19th century itinerant or carnival players. See the photo below. 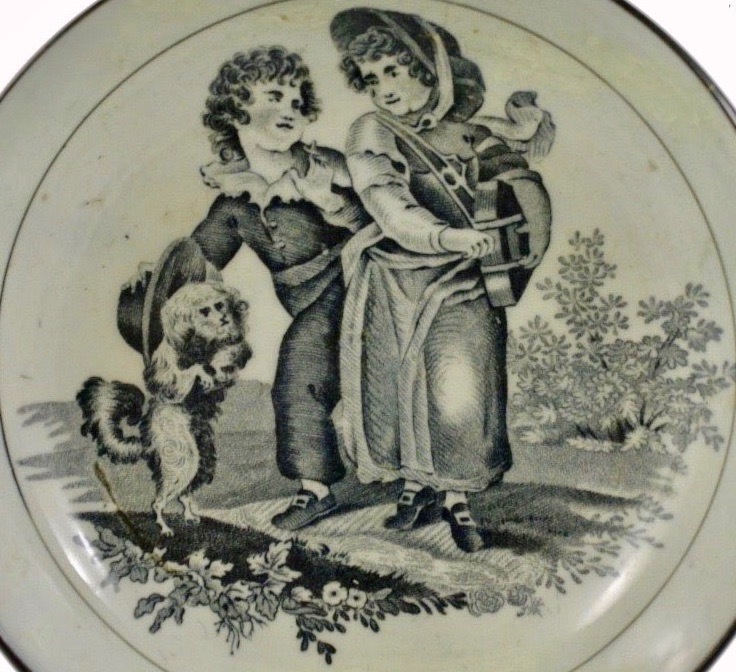 As I have said many times, transferware patterns lead me to new discoveries such as this history of the hurdy-gurdy. Is the instrument still played today? Yes! Google Hurdy-Gurdy and lots of YouTube videos will appear. 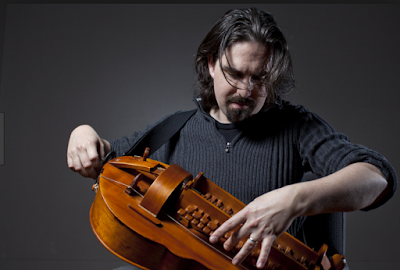 Composer Bear McCreary plays his hurdy-gurdy. Or listen to Donavan sing his '60s "Hurdy Gurdy Man." And hear Schubert's 1830s "Der Leiermann" (Hurdy Gurdy Man).